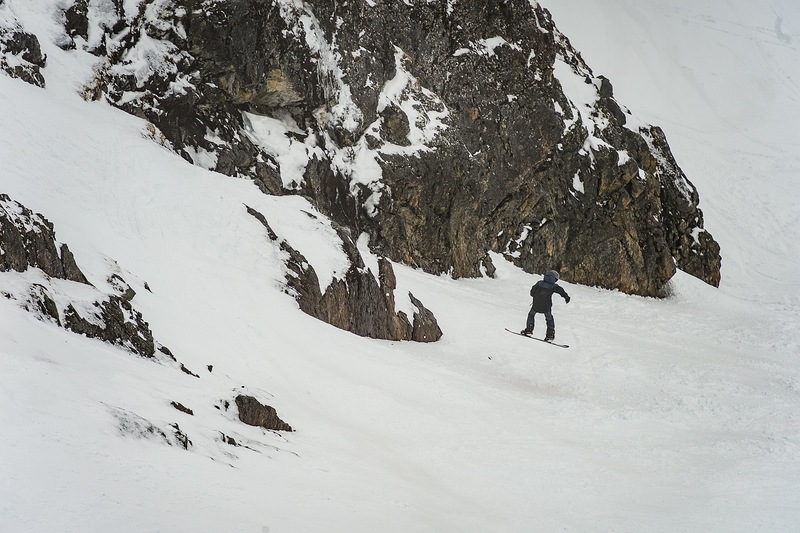 Mt Olympus was the setting for the first stop of the inaugural New Zealand Junior Freeride Tour. This is an epic location to begin the NZJFT circuit. 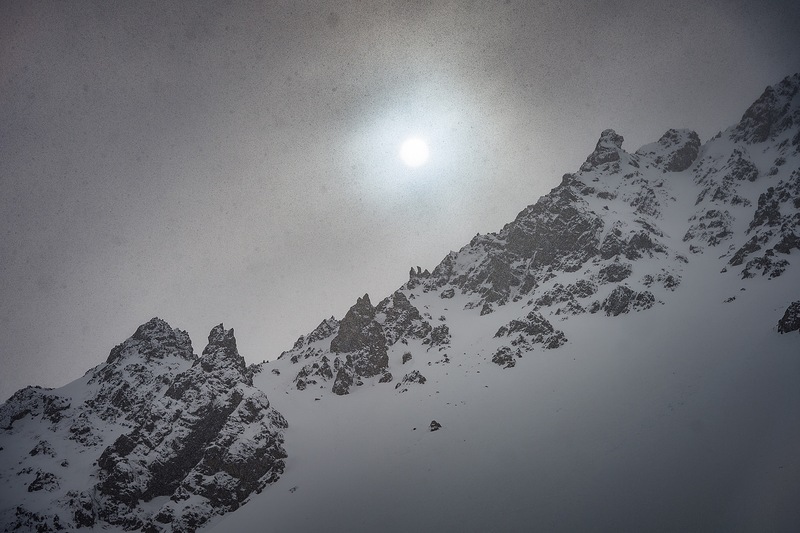 Nestled in the mountains of Canterbury, Mt Olympus has the slogan “playground of the gods” for good reason. The terrain is epic, the main lodge is plush and sleeps 60+, there is a hot tub & a bar that matches prices of any bowling club. The atmosphere at this NZ club field is one in a million so with all of these luxuries in mind, it was an easy selection for the opening event of the tour. The tour is presented by Groovstar Outerwear NZ, this world famous in New Zealand brand is responsible for getting the tour off the ground. 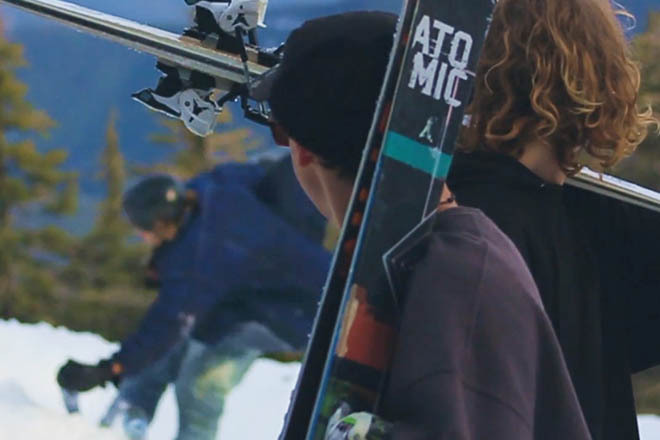 Groovstar is also joined by an incredible line up of supporting sponsor’s – Mons Royale, Volkl skis, K2 ski’s & snowboards, Smith Optics, Pow gloves & Black Diamond Safaris. 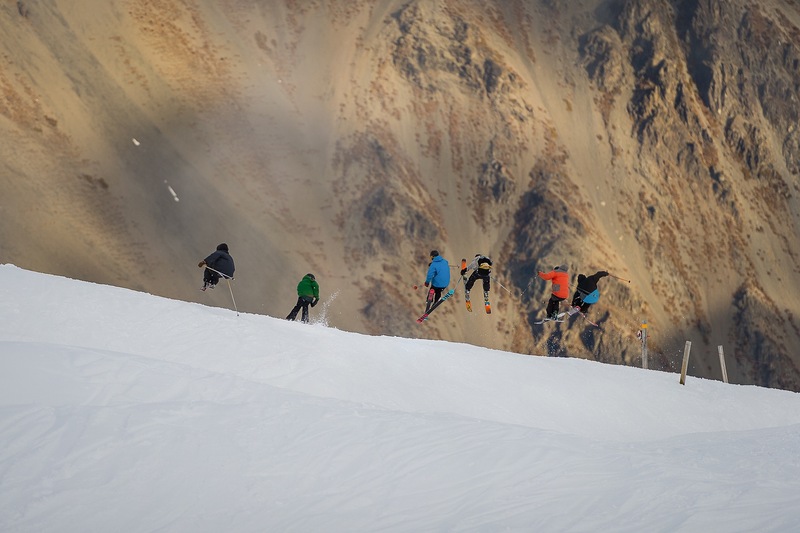 The NZJFT is sanctioned by the prestigious Freeride World, this tour will give the young riders involved a chance to earn points on the Freeride Junior Tour. 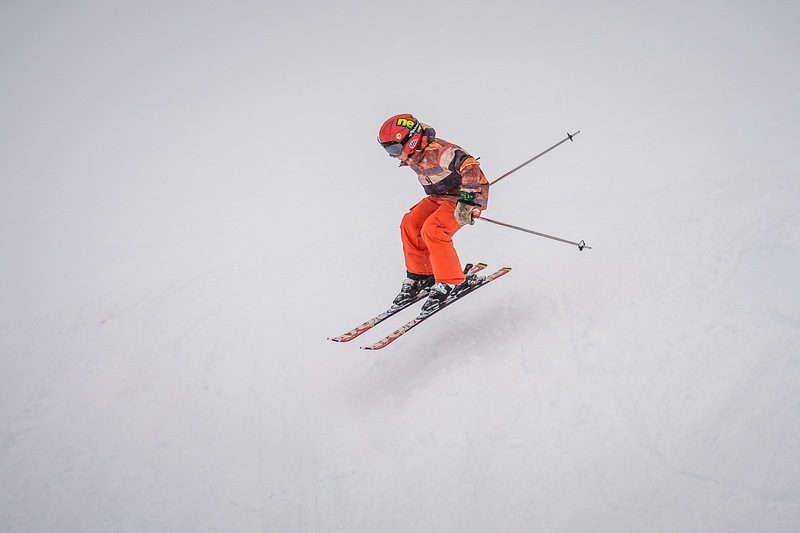 In addition to earning points, some lucky riders will receive wildcards for the Freeride Junior World Championships held in Andorra in 2016. 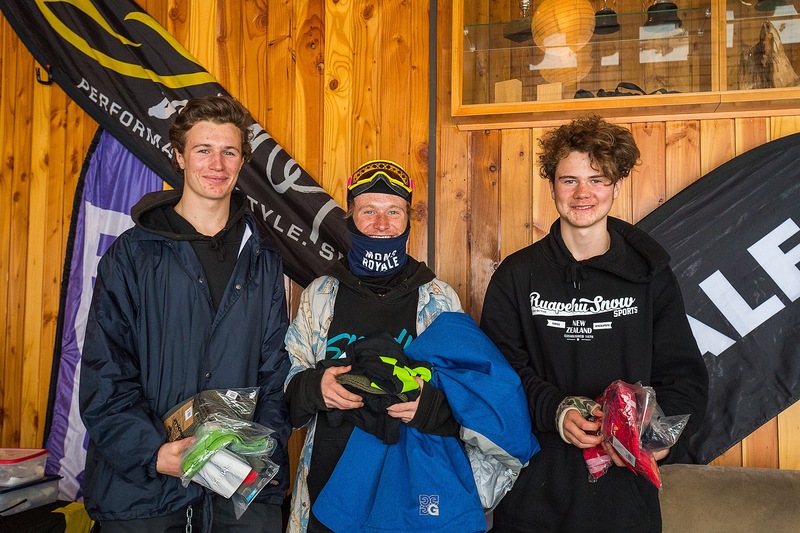 There was a 30+ strong field on Saturday morning with some big name NZ juniors involved. 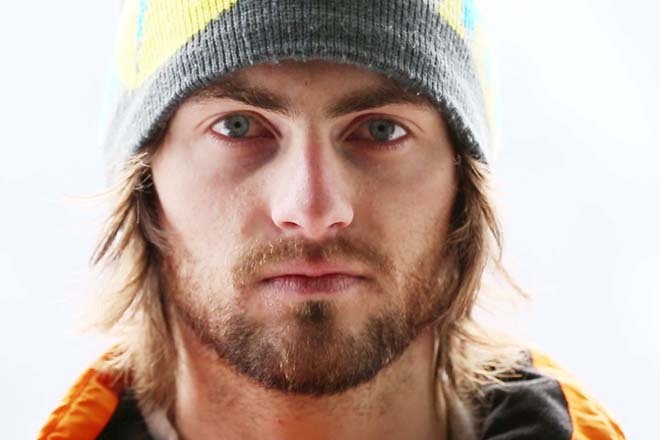 The 15-17 Ski Men’s category kicked off, but after only 4 riders, a skier rode out of bounds, slipped on ice and took a very serious fall. He needed helicopter evacuation and the rescue crew did an incredible job stabilising Finn and getting him to a safe point for the helicopter. It was necessary to postpone the event until the safety team had returned to the venue, which then proved to be too late in the day. The decision was made to run the event on Sunday. 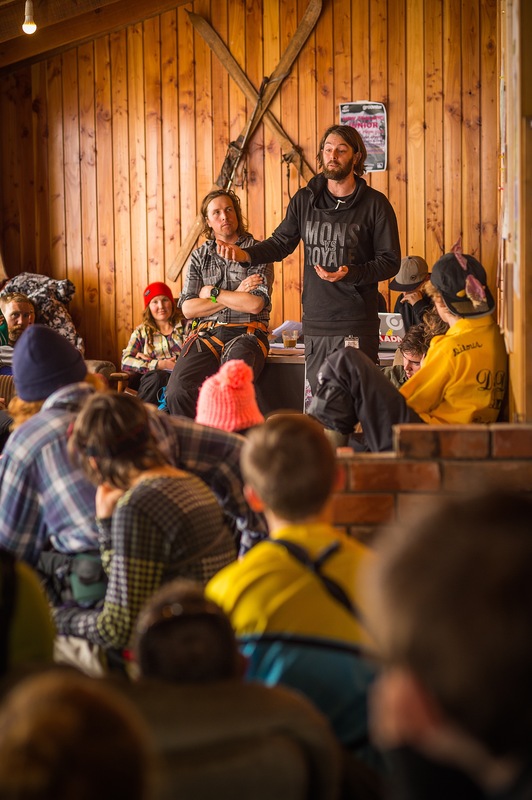 The weather gods were against the NZJFT – the clear skies over night made the snow rock solid and extremely dangerous in the venue. A third venue had to be chosen, forcing a quick turn-around yet again. 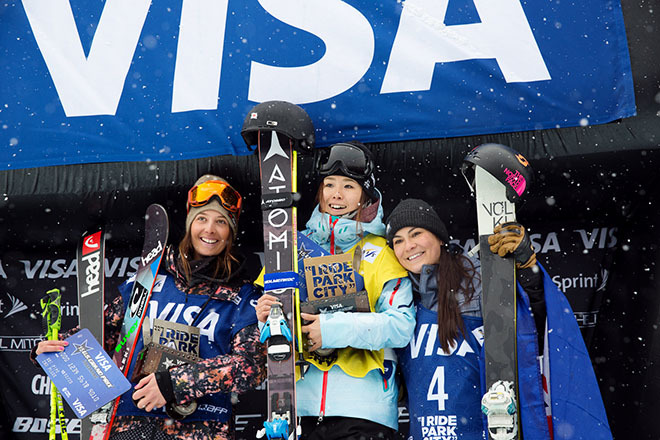 The juniors were resilient throughout the multiple venue changes and delays. 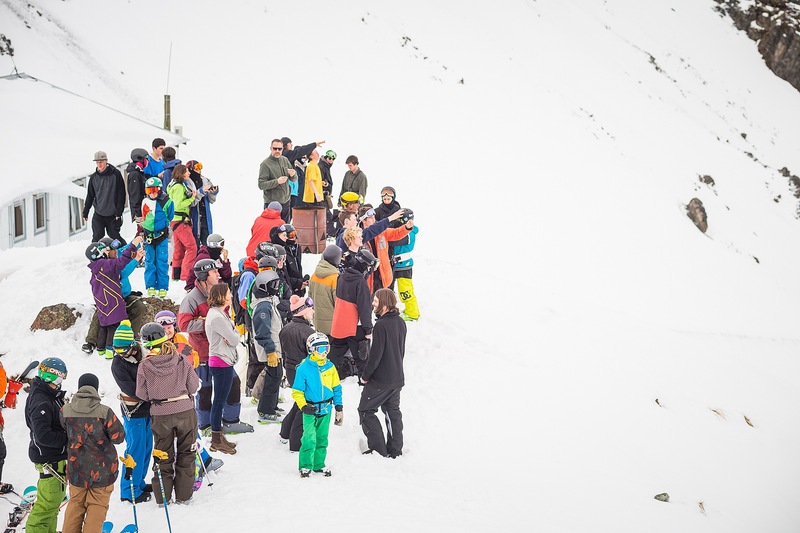 After the accident the previous day, judges were anxious to hit the hard facts home to the Junior’s about skiing within their abilities and respecting closed areas. The kids didn’t hold back, but made smart decisions on the day, impressing judges with their prowess while also not scaring their Mums and Dads. 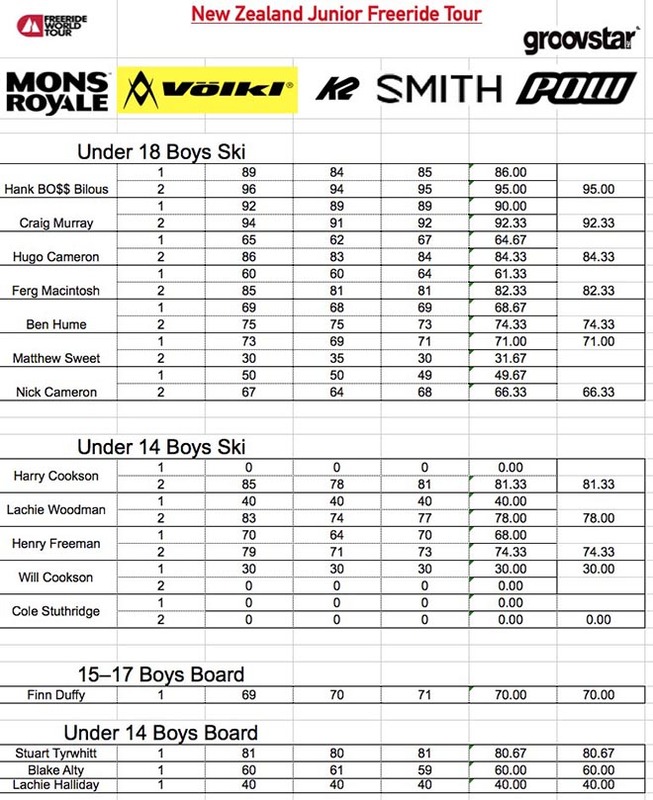 A Rider who looked in his element in the hard and fast conditions was local Olympus skier Harry Cookson. 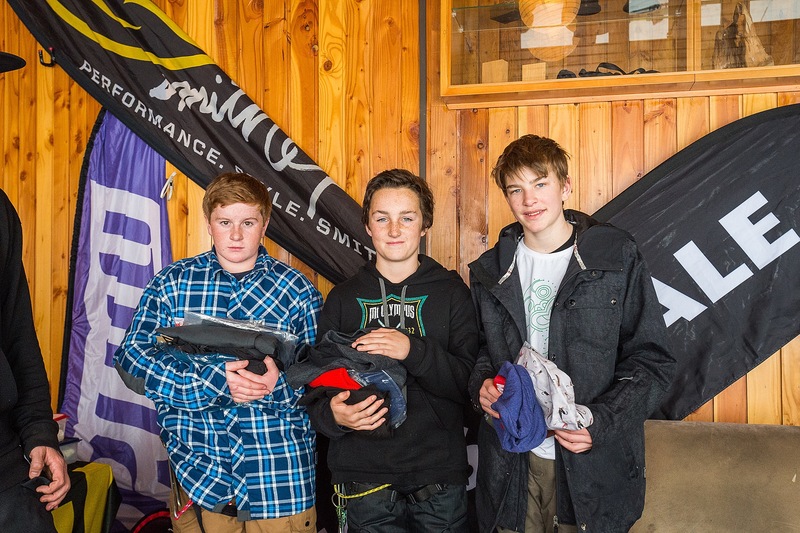 He championed the 14-15 Men’s Ski Category with some strong skiing and tidy airs. Another stand-out performance was that of Hank Bilous, with a score of 95 points, Bilous was a tough one to beat. His stylish 360 off the bottom feature was a definite highlight, especially when he kept repeating this number en force with his rat pack after the competition was over! 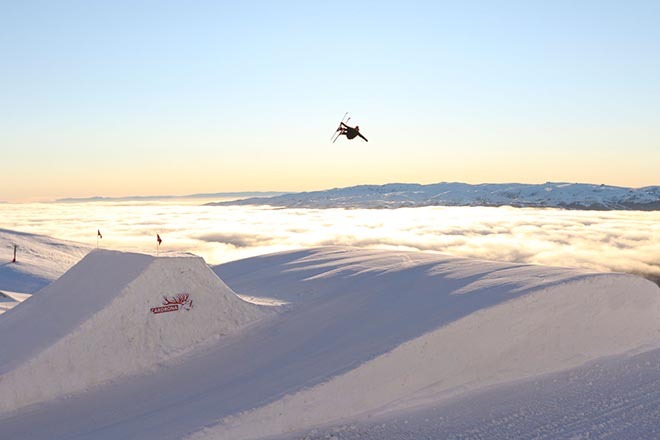 Joining him on the podium was Craig Murray who showed us the work he’s been putting into the park by incorporating a sneaky double grab into his run. Most impressive on the day, was the attitudes of the competitors. 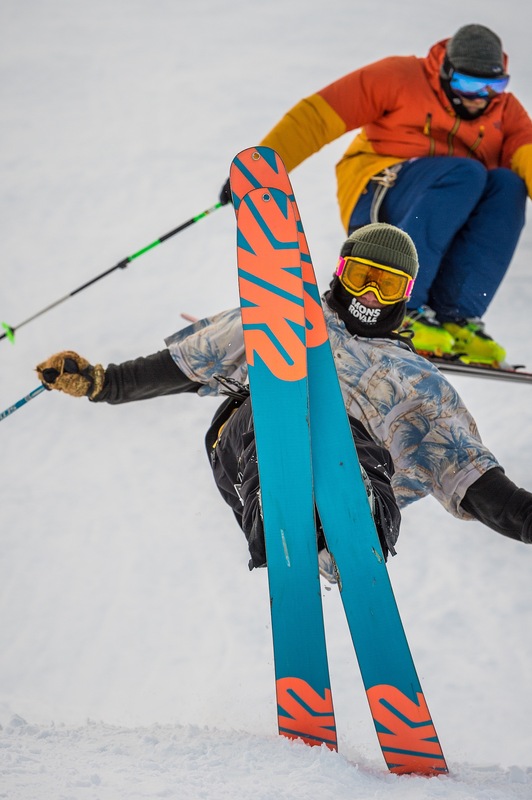 Freeride is tough when the conditions force multiple changes and delays, but they were throwing down nothing but positive vibes. Amidst the adversity they were helping each other choose new lines, eating way too much sugar and having a whale of a time! Sending well wishes to Finn with his recovery and a huge thanks to our sponsors!